Healthy Home Restaurant | Page 2 of 4 | Planning healthy and delicious home cooked meals. Pawan and I have been slowly moving our family’s diet towards gluten free foods. 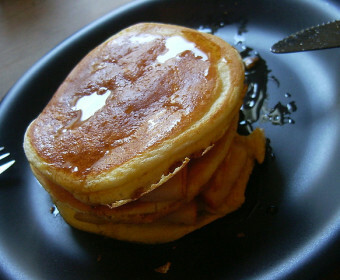 It’s not easy, especially with family favorites such as Grandpa Pawan’s Olde Fasion Box-less Pancakes. On a whim, we threw together some ingredients that worked well for a previous gluten-free zucchini bread recipe. Could it work for pancakes? The results were serendipitous-ly awesome. Kids couldn’t notice the difference and we felt great we found a gluten-free option for such a gluten-heavy start to the day. We needed a couple ingredients that we don’t normally use – things like xantham gum and tapioca flour that help create the “stretchy-ness” of gluten in normal recipes. But after creating this recipe, we’ll definitely be using them again. Preheat your electric griddle to 250F or a pan on low-medium on your stove top. Combine all The DRY ingredients in a large mixing bowl. Make sure it’s large enough to accommodate all the other ingredients that we’ll add later. Set aside. In another bowl thoroughly mix all The WET ingredients together. Then pour the WET mixture in the bowl with The DRY ingredients and mix with a whisk. Set aside. In a small mixing bowl, whip up the egg whites with a hand mixer at until it becomes white and fluffy. You’ll know when it’s done once you stop the mixer, lift it out of the eggs, and you can see firm peaks. Here’s a video to show you what I mean. Slowly put the whipped egg whites in with the big bowl that has the batter. You don’t want to over mix b/c you want to maintain all those bubbles. I like using a wooden spoon for this. Now you can pour it out on the griddle to make some yummy pancakes. NOTE 1: Quinoa flour adds a nutty, slightly bitter flavor (like walnuts). Some like it, but if you don’t want that, you can use coconut flour. NOTE 2: The milk has to be warm enough to melt the coconut oil (which usually solidifies at room temperature) but not so hot that it cooks the egg. (One minute in the microwave works for us.) If you use sweetened almond milk, you can reduce the sugar in The DRY ingredients to 1 tbsp. Star anise is one of those ingredients that are just as cool to look at as it is to enjoy in the dish you are making. This seed pod from an evergreen tree is slightly more bitter than the “regular” anise used in candies, but still has that unmistakable aroma of licorice. Liquors such as sambuca, ouzo or absinthe use star anise as one ingredients in production. The whole star-shaped pod is usually thrown in big pots of stock for noodle dishes and then removed before serving. 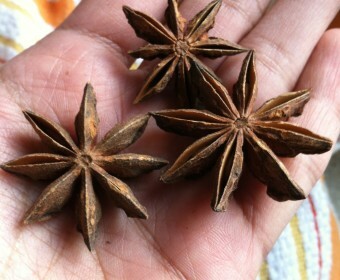 Ground star anise is used on rubs for heartier meats such as pork or beef. A little goes a long way – so be sure to try it out in a few recipes before experimenting on your own. Having never used star anise before, we made a popular Vietnamese Noodle Stew called “pho” using our crock pot. The recipe asked for a lot of other ingredients and after stewing for several hours, the strong licorice flavor of the star anise was cooked out. A mellow, smokey, sweet taste remained. We halved the amount of star anise pods required, which was a good thing. Any more, and it the flavor would have been too much. You can get star anise in any spice shop. If you head to the bulk section, you can get only what you need. Be sure to store it an air-tight container or two freezer-quality resealable bags to ensure the licorice aroma doesn’t escape. If you can’t find star anise, regular anise seed can work. Just substitute 1/2 teaspoon of regular anise seed for every pod of star anise required in the recipe. I love dishes that make you say, “Wow – this tastes wonderful, and there’s something in here that I can’t put my finger on…” Star anise is one of those “mysterious ingredients” that impart a flavor that is truly unique. 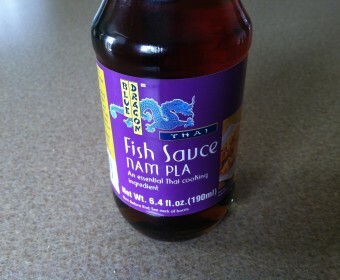 Fish “sauce”? I know – it sounds strange, but fish sauce is a very popular ingredient in cuisines all over the world. Before refrigeration, fish was cured in salt to make it last longer. To turn it into a sauce to add in dishes was an obvious next step. The fish sauce you find in the Asian sections of supermarkets today are a mixture of fermented anchovies, sea salt, and other ingredients. Similar to soy sauce (where the soy mash is fermented and mixed with salt and water), fish sauce is used to make a dish salty and sweet. Fish sauce isn’t that foreign. 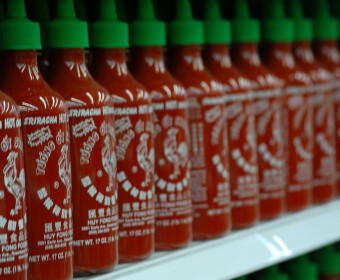 If you enjoy Pad Thai at your favorite Thai restaurant, you’ve had fish sauce. Also – if you enjoy Worcestershire sauce on your steak, you’ve had the European equivalent of fish sauce – as it’s made with, you guessed it, fermented anchovies. We have used fish sauce in our Vietmanmese Noodle Stew (Pho). Check it out! A squeeze of lime just before eating tastes amazing. Pho is a classic Vietnamese street food, much the same way Pad Thai is to Thai cuisine or fried rice is to Chinese cuisine. This dish calls for some ingredients that you may not use for any other recipe, so we’ve included some substitutions. Also – the recipe instructs you to add a lot of whole spices to simmer for hours, then remove at the end. Using a slotted spoon works best. 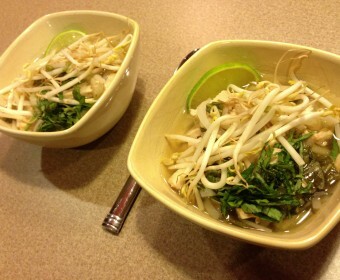 The following recipe does make a lot of pho – which can be frozen and reheated wonderfully on cold winter days. This is almost like the Vietnamese version of chicken noodle soup, but the fresh herbs and squeeze of lime just before serving takes it to a new level. Pho is naturally gluten-free if you use rice noodles (be sure to check the box). You can make this vegetarian/vegan by removing the chicken, using vegetable broth, and replacing the fish sauce with soy sauce. Adapted from Slow-Cooker Chicken Pho recipe on EatingWell.com. 2 tablespoons fish sauce or soy sauce << Um, fish sauce? *Use organic ingredients wherever possible. Combine broth, brown sugar, fish sauce, star anise, cloves, ginger and cinnamon stick in a 5- to 6-quart slow cooker. Add chicken breasts, meat-side down. Cover and cook on High for 3 hours (or on Low for 6 hours). Transfer the chicken to a cutting board to cool. Remove spices and discard. Add noodles and bok choy to the slow cooker. Cover and cook on High for 30 minutes. Shred with two forks. When the noodles are tender, stir in the shredded chicken. Serve bowls of soup with bean sprouts, basil, mint, cilantro, sliced chile and lime wedges on the side so everyone can add their own toppings. Image courtesy of Flickr user ilovememphis. Mix it in with your favorite barbecue sauce to add just the right of heat and a unique tang. Add it in mayonnaise on sandwiches and burgers. Chili! Tex-mex and Asian cuisines blend so well together. Add it just as you serve up each bowl. Pizza/Calzones – as long as there isn’t too much rosemary. For some reason rosemary and sriracha taste strange. That’s just me though. You’d be surprised how many times you’ll use it. We use it frequently throughout the recipes both in dishes and as a garnish. Flavor Feature: The key to planning an exciting home restaurant menu often lies in experimenting with one key ingredient. In “Flavor Feature” posts, we’ll put the spotlight on these special items to bring variety to your kitchen. 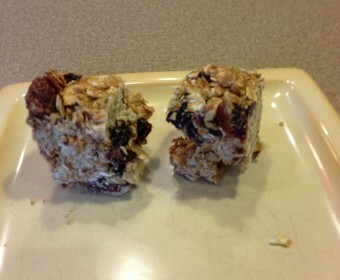 Home-made granola bars. Sounds like it would be easy…after 2 attempts I finally have an idea what I need to do next time! The first time they were too thin and burned in the oven. The second time they were too thick and crumbly. Next time…they will be perfect! I’m hopeful I can figure this out. At least the second batch makes for a good “cereal” or parfait. It goes great with yogurt for breakfast or an after school snack. 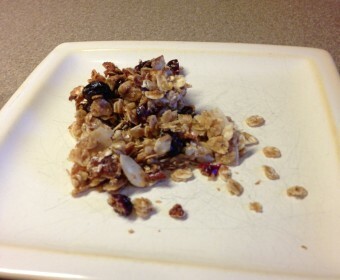 Adapted from Alton Brown’s Granola Bars recipe. 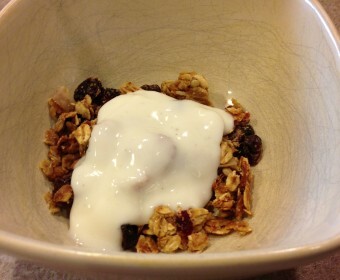 Once the oat mixture is done, remove it from the oven and reduce the heat to 300 degrees F. Immediately add the oat mixture to the liquid mixture, add the dried fruit, and stir to combine. 5. 5. Turn mixture out into the prepared baking dish and press down, evenly distributing the mixture in the dish and place in the oven to bake for 25 minutes. Remove from the oven and allow to cool completely. Cut into squares and store in an airtight container for up to a week. These wraps are delicious. Light, yet filling – and full of flavor. I credit the original recipe to Food.com, but have made some modifications that make it tastier and easier to cooking and eat. First I quarter the chicken breasts so it cooks faster and more even. 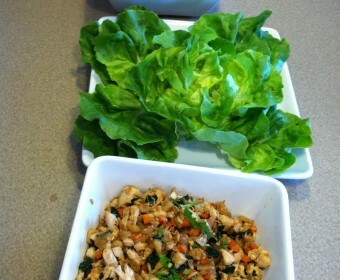 Second, I swap out the iceberg with Bibb or Boston lettuce because it’s easier to wrap. The kids wanted mac and cheese. I didn’t want a box because of all the junk in there. Found this recipe online that was simple enough and used ingredients we had, since this was an impromptu lunch request. I had to modify a few of the ingredients but overall it was a good first attempt! I’ll keep working on it! The 5 year old asked for different noodles (I had to use whole wheat penne) and for it to be creamier. Good suggestions to run with next time! 1. Boil the Pasta: Bring about 2-3 quarts of water to a boil over high heat in the pasta pot. Add the pasta and a tablespoon of salt. Cook until the pasta is al dente, about 8 minutes. Drain and set aside. 2. Warm the Milk: When the pasta has finished cooking, prepare the cheese sauce. Begin warming half of the milk in the saucepan over medium heat. Whisk together the remaining milk and the flour until there are no lumps. When you just start to see tendrils of steam rising from the warming milk, whisk in the milk-and-flour mixture. Continue whisking gently until the milk thickens slightly to the consistency of heavy cream, 3-4 minutes. 3. Make the Cheese Sauce: Turn the heat to low and begin mixing handfuls of cheese into the milk. Stir in the salt and mustard. Stir until all the cheese has melted and the sauce is creamy. Taste and adjust the seasonings as desired. Remove the sauce from heat. 4. Combine the Pasta and Cheese Sauce: In a large serving bowl, combine the pasta and 1/2 of the cheese sauce. Stir to coat the pasta evenly. Add the second half of the sauce and any extra add-ins. 5. Serving and Storing Leftovers: Serve the mac and cheese immediately while still warm. Leftovers will keep for up to a week and can be reheated in the microwave. 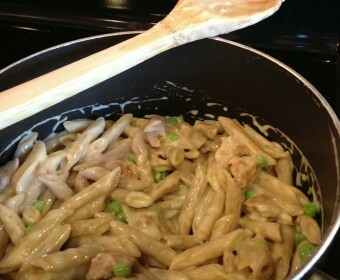 If the sauce is a little dry after re-heating, mix in a splash of milk to make it creamy again. 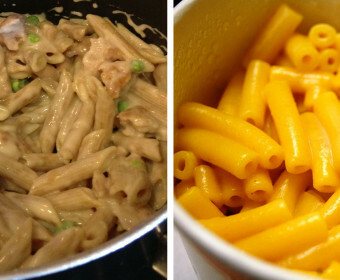 Let’s compare the ingredients of Kraft’s Mac and Cheese and a homemade macaroni and cheese made with whole wheat pasta and all organic ingredients. Image courtesy of Flickr user stormgrass. Free yourself from the tyranny of the pancake mix box! You probably have most of this stuff at home already. Makes about 8-10 pancakes depending on their size. Use organic ingredients wherever possible. If using an electric griddle/skillet, turn on to 250F. Measure all dry ingredients (flour, corn meal, baking powder, salt, sugar) in mixing bowl. In another bowl (preferably with a spout or lip), whisk together the oil, egg, and milk until very well mixed. Quickly add the oil/milk/egg mixture to the bowl with the dry ingredients. Mix with whisk. Be sure you don’t over-mix – literally about 10-12 “strokes” should do it. Lumpy is OK as long as you don’t see any dry powder. This ensures a fluffy pancake. Let the batter sit for 3-5 mins and you’ll start seeing bubbles coming from the baking powder. 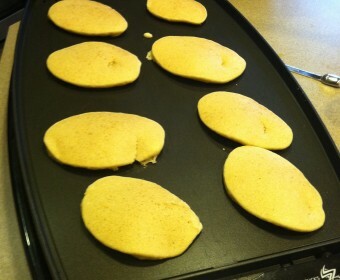 Spoon batter onto griddle or non-stick pan using ice cream scoop. Let the pancake cook on one side until you start seeing bubbles. At this point, you can add blueberries, chocolate chips, or nuts. Flip and wait until golden brown on both sides.